One of my favorite flavor combinations is peanut butter and chocolate. The sweet and salty combination makes me happy every time. 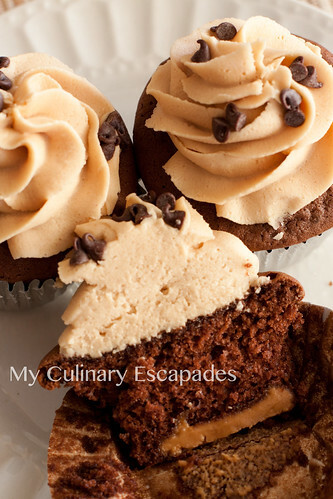 These peanut butter bottom cupcakes are so easy to make that you might find yourself making them a little more often to satisfy your craving. I start them off with a box mix and add peanut butter to the bottom of the cupcake liner. Creamy peanut butter works best but crunchy can be good too. Go with what makes you happy! The icing is easily whipped up with a couple of ingredients. 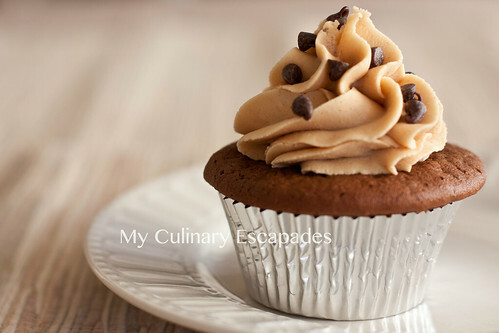 It creates a little pillow of peanut buttery goodness on the top of the chocolate cake. I topped them with some mini chocolate chips to give a little chocolate bite. Mix box cake mix according the the instructions on the package. Line cupcake pan and place 1 tsp peanut butter in the bottom of each liner. Bake according to the directions no the box adding 4 minutes because of the addition of peanut butter. Cool cupcakes in pan for 10 minutes and then transfer to a wire rack to fully cool before icing. Cream the butter and peanut butter together until well mixed. Add the 2 cups of powdered sugar slowly until incorporated. Add vanilla and milk until desired consistency is achieved. If frosting is too stiff add more milk, if it is too loose add more powdered sugar. Pipe frosting onto your cooled cupcakes. I like the way the 2D tip looks on cupcakes so that is what I used here. Place mini chocolate chips in your hand and gently push your icing into the chips. Turn cupcake and repeat until desired look is achieved. Enjoy with a nice tall glass of milk.